Reach for the skies! From our friends at Shasta Visions comes this super cool set that features our biggest Earth marble ever! This set is the closest we have come yet to being to scale, with a ratio of 1:300 million! This three marble set comes with a display case container, a handy carrying pouch and an information sheet with great info and game ideas. 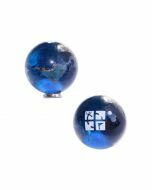 This unique and geographically accurate set is made of recycled glass, and each of the marbles even has the official Geocaching logo! They are handmade in the U.S.A, and a portion of every sale is donated to environmental organizations. 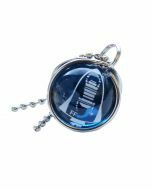 These make great gifts to or from geocachers, premium SWAG or an amazing FTF gift! 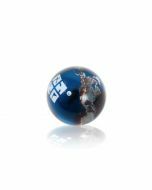 One each marble: Earth, Mars and the moon. Informational sheet with facts and games. Made of recycled materials in the U.S.A. These items are not trackable, but each has the official Geocaching logo. Note: Not for children under 4 years of age.